WESC Tour. Photo by Jeramey Jannene. Just under two years after work started, the Wisconsin Entertainment and Sports Center is nearly complete. You know, the new Milwaukee Bucks arena. 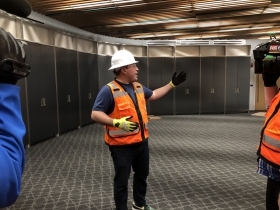 Bucks president and effervescent impresario Peter Feigin led the press on an arena tour Friday morning, showcasing everything from enormous locker rooms to the soaring atrium. 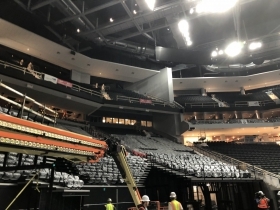 The team anticipates moving into the arena in July and beginning operations in August. He compared the remaining work to a punch list on a home improvement project, but instead of 30 things, Feigin joked that there are more like 3,000. A crew of 350 was on site Friday working to clear that list, down from over 800 when the team held a ceremonial topping off ceremony last August. A representative from Mortensen, the project’s general contractor, said that more than 3,700 people have worked on the project, many of whom were participants in the city’s Residents Preference Program designed to create jobs for unemployed or underemployed city residents. 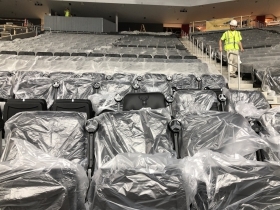 Feigin is quite pleased with how things have turned out, and so is everyone that tours it with him, he adds: “The satisfaction on tours is 100 percent.” The team is now giving tours to prospective season-ticket holders, and can show the actual seats available, with 96 percent of them having been installed. Under the main floor, the team was ready to show off the 30,000-square-foot locker room campus. 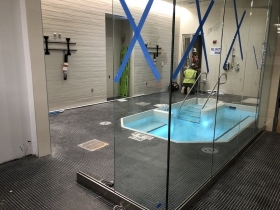 The campus, really a series of rooms instead of a single large room, contains everything from oversized lockers with private safes to a hydro-therapy room complete with large whirlpool. Drawing delight from many press folks on the tour, the media interview room and media dining room are substantially larger than what was available at the BMO Harris Bradley Center. The visiting locker rooms are also substantially larger, something that’s been an issue for the Bucks with the Bradley Center. “We want every player in the NBA to think this is a great place to be,” said Feigin. Similarly-sized rooms exist for visiting entertainers booked to perform here, as well as for Marquette University‘s Golden Eagles team. 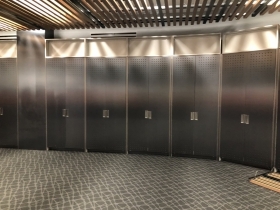 And while locker rooms are certainly a private thing, the public will be able to see them as part of arena tours that the team will regularly offer. The large atrium appears nearly complete, with everything from escalators to signage for the year-round team store installed. 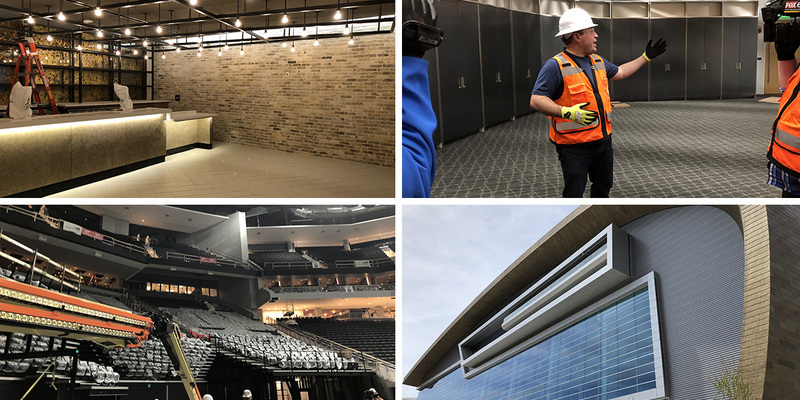 Besides being the front door to the arena with floor-to-ceiling glass, the team has visions of hosting everything from weddings to corporate events in it. “It’s going to be one of the greatest places to have an event in Milwaukee, bar none,” Feigin declared. Above the atrium, the mezzanine club is also nearing completion and is already a clear cut above any Bradley Center club. The space, which has a 900-person capacity, is accented by reclaimed wood and Cream City brick as well as large metal pieces by Milwaukee-firm Scathain. The club also features an overlook of the arena and a 32-foot-long fireplace that ties the many bars and restaurants in the complex together. There are a couple major announcements from the Bucks still to come. Notably, the naming rights for the arena itself. Feigin teased reporters saying there was no update, but added “I know what this is arena is going to be called.” He told Urban Milwaukee that the partner, whoever it is, intends to leverage the roof of the building to display their brand. 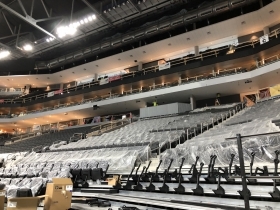 In addition, the team has yet to announce what the opening act will be in late August, but Feigin says the team anticipates announcing that soon, along with a list of open house-style events. Outside of the arena, work continues on the “Live Block” entertainment center, but no tenants have been announced and Feigin said he didn’t have updates on that today. and yet the pot holes on the NW side continue to increase in size and number. The MPS meltdown continues. Slumlords run rings around MKE City Attorneys. Good deal! New venues for wealthy team owners are heavily subsidized with tax dollars. The “old” buiklding was’t even that old! How many school buildings are replaced on the same schedule? None. Why are taxpayers expected to heavily subsidize wealthy team owners (who make more money from the subsidy)? Why aren’t we getting a fair share of the profits? Professional sports franchises – privately owned but publicly funded entities. Let’s cut bus routes traveling to suburban jobs for inner city residents. Our roads and infrastructure don’t need repair. We do need a new Bucks arena. Hot dog vending jobs will bring family sustaining wages to the area.